Lucas Natalini--Where Have all the Clay Courts Gone? Today Lucas Natalini joins us to share his experience with Tennis League Network after having reached 'Veteran Status' after playing 25 games. 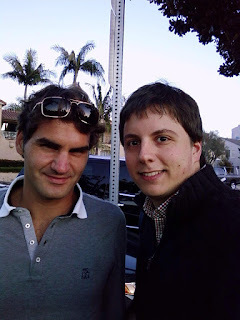 He's a member of the Tennis Los Angeles franchise and currently plays on the Westside of town. Lucas came to the US 5 years ago. His first tennis games here were tough as he had become so used to playing on slower clay courts, which are everywhere in Buenos Aires. After putting in work he is back on his game. He's come a long way and he hopes to win his division. Congratulations are also in order as he and his wife are expecting their first child next year. Hi Lucas. Thanks for taking the time to share your experience with the league so far. To start, could you tell us a little bit more about yourself? I was born in Buenos Aires, Argentina. 99% of the courts are clay courts so the game is slower. When I was 23 I went to a concert and I met an American girl who was taking Spanish classes in Argentina. She was the reason why I moved to the US. We are now married and expecting our first child next year. I moved to the US in 2010 and I remember that the first few matches I played were the first on hard courts. I was lost. The ball was bouncing so low and after the bounce it was traveling through the air so fast. I lost pretty much all the matches I played for a year or so. I was only playing with people I knew through work and some relatives and in 2013 I started doing some research online and I found this league. I thought the concept was great so I gave it a try. I played 5 matches and I only won one. I had to stop playing tennis because I was overwhelmed with my new job. This year I felt that I really wanted to play tennis and the only way to get good at it is to do it regularly. I took classes with a great coach for about 8 weeks. This fall season is my third tournament in 2015 and I fell my game has improved a lot. I hope I can win my division sometime. Which league are you a member of? And since you joined, about how often do you play? How long have you participated in your specific league? I played one tournament in 2013 and this is the third I played in 2015. In all the years you've been playing tennis, what do you love most about it? I like that you are on the court by yourself. I grew playing soccer, rugby and volleyball and in those sports there is always somebody to help you. In tennis, it's just you. No matter how much professional players like to thank their coaches and physical trainers, the person on court is the one doing the job. I like that I am the one winning or losing a match. Since joining, what is it that you like most about our league in particular? A few things. I like the competition, getting to know my opponent and also, I like that we are all trying to get better. I can definitely notice some improvements in some guys. Can you tell us about your most memorable match in the league? Or multiple matches? I was playing Steve Chocron for the first time. We both have similar game styles. We went to a third set. I was serving 3-4 and 30-40. It was after 9PM. I faulted on my first serve and the employee from Roxbury comes and says: "Guys, I am going home"...and he turned off the lights. So Steve and I met again the following week and that whole week the only thing I was thinking was that whatever I did, I could not double fault. That is what ended up happening. He started serving 5-3 and somehow I broke his serve. We got to the tiebreaker and he beat me. It was a great match and after that match I definitely learn how important the mental part is in tennis. Based on your picture, we're guessing Roger Federer is your favorite player. If so, why? I have always looked at sports the same way. If you want to win you need to attack. Federer attacks since the first point. I can write a book about all the reasons why I think he is great. Just to answer the question I think his game represents the way I would like to play tennis. Do you have any other interesting comments about your experiences with the league? I really enjoy the fact that we are all taking time from our lives to play this beautiful sport. Excellent. Well thank you for your time, and best of luck on your future matches.